You have my lovely daughter to thank for this title and she spent the best part of the day highly amused by her own wittiness. 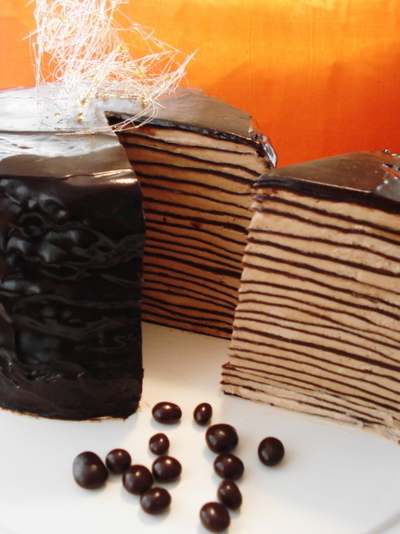 For indeed what you see before you is a cake made from layers of chocolate pancakes, (yes, technically speaking they are crepes but that wouldn't have quite the same ring to it) hazelnut meringue cream filling and a chocolate ganache to glaze the entire edifice. Restrained? No. Pure indulgence? Yes. Would I make it again? I don't know. It would make a beautiful dessert-style cake for a birthday dinner topped with a cluster of celebratory sparklers or candles, but they would have to be someone special. It certainly has the wow factor with crisply defined, contrasting layers of light and dark that are both beautiful to look at and utterly divine to taste ( I had to tell one of my tasters to get a room!) There is no denying that it is time consuming and demands all of your attention for most of this time. Having said that, I would advise you to go for it, just to relish the look on your victims guests faces when you unveil your masterpiece. The recipe is a Martha Stewart one, chosen by Brilynn at Jumbo Empanadas, and the advice that I (and all the others no doubt) would give is to take your time. Do it in stages over a couple of days so you don't feel imprisoned in your kitchen, read through the recipe a couple of times first so you won't have to run out to pick up any ingredients when you're up to your elbows in batter and be prepared to sacrifice your fingertips when flipping those fragile crepes! Make as many layers as you are comfortable with. I used a 8 inch crepe pan with flared sides so mine ended up being about 7 inches across. I made 32 and used.. just a second... 21 crepes before it started leaning drunkenly so I took that as my hint to stop (I reckon Martha used superglue for hers). One other thing, if this is for a celebration, make sure you're not the one making the rest of the food too, the last thing you want to do after spending two days making dessert is to turn around and prepare the meal that precedes it! Follow the links on the Daring Bakers blog roll on the main page to see many more tempting versions (the authors are not resonsible for the excessive consumption of this cake). My only slight alteration was to substitute a little of the chocolate for the glaze with a Green & Blacks Espresso chocolate I found. The hint of coffee matched well with both the chocolate and the hazelnut though only a hint so as not to be overpowering. After the weeping and gnashing of teeth that could be heard across the Atlantic ocean I can't wait to drool over what the others have done. As we soothe our poor fingertips, (we won't be leaving incriminating evidence at a crime scene anytime soon) we can only try to imagine your expression as we humbly unveil for you our own masterpieces. Modesty has left the building. Bring 60 ml of water to a rolling boil in a small saucepan over a medium-high heat. Add butter, one piece at a time whisking to combine after each addition. remove from the heat; stir in the chocolate until completely melted. Set aside. Whisk together flour, sugar and salt in a medium bowl. Whisk the milk, eggs and vanilla together in a large jug. Make a well in the centre of the flour mixture and gradually whisk in the milk mixture drawing the flour in from the sides as you whisk. When you have a smooth mixture add the chocolate-butter mix again whisking until smooth as possible. Pour through a fine sieve into another container and cover tightly (with a lid if you have one to fit, or with cling film.) Discard any lumps and refrigerate for 2 hours or up to overnight. To make the crepes: Lightly coat an 8 inch crepe pan (or whatever frying pan you have, it being non-stick will make your life a whole lot easier) with melted butter. Heat over a medium heat, remove briefly from the heat to swirl in 2-3 tbls of batter covering the bottom of the pan. What you want is a crepe that is thin enough not to taste rubbery while at the same time able to withstand a certain amount of handling. Reduce the heat slightly and return to the heat. Cook, turning once as best you can (your fingers have my sympathy) for 30 seconds-1 minute each side until cooked through in the centre. Slide the crepe onto a plate and repeat the process until you run out of batter, layering with parchment paper between each crepe. Refrigerate until your ready to assemble the cake. Put cream into a bowl a medium bowl and beat at a medium-high speed until soft peaks form. Refrigerate for an hour or so. Whisk the egg whites and sugar in the bowl of a stand mixer set over a saucepan of simmering water until sugar has dissolved and the mixture registers 160 C on a sugar thermometer. Remove from the heat and attach to the stand mixer with the whisk attachment and beat on a high speed until slightly cooled and soft (but not dry) peaks form, about 5 minutes. Switch to the paddle attachment and at a medium-low speed, add the butter, several pieces at a time, mixing well after each addition (meringue will deflate slightly). Add vanilla, nutella and salt, mix well until mixture comes together, 3 to 5 minutes. Fold in chilled whipped cream with a rubber spatula. Use immediately. Retrieve your crepes from the fridge and place on an 8 inch (or whatever size your crepes are) cardboard round (I cut a round to fit from a cereal box and used the plain side) on a wire rack over a baking sheet. Place the first crepe on the card and spread with about tbls of the filling. Top with another crepe. Continue layering with the filling until you have run out of crepes (or filling) or until your tower begins to lean alarmingly, ending with a crepe on top. Refrigerate until firm at least 15 minutes. Meanwhile make ganache. Bring cream, golden syrup and salt to a boil at a medium-high heat in a medium heavy-based saucepan. Remove from the heat and add the chocolate, swirl pan to cover completely with cream. Leave to stand for about 5 minutes. Stir until smooth. Let cool completely. Thread each hazelnut onto tip of a long wooden skewer; set aside. Place a chopping board along the edge of a worktop; set a baking tray on the floor underneath. Cook sugar and 60ml of water in a medium, heavy-based saucepan over a medium heat, stirring occasionally, until sugar has dissolved. Continue to cook, without stirring, until syrup comes to a boil, washing down sides with a wet pastry brush to prevent crystals forming. Let boil until syrup turns light amber, about 5 minutes; remove from heat. Let stand until slightly cooled. Dip one skewered hazelnut into syrup, coating completely and letting excess caramel drip back into pan. When dripping caramel becomes a thin string secure end of skewer under chopping board, letting string drip over edge onto baking sheet. Repeat with remaining hazelnuts. Let stand until caramel has hardened, about 5 minutes. Break strings to about 4 inches. Carefully remove skewers. Or just attempt as I did to make spun sugar by taking spoonfuls of caramel and drizzling them quickly (but carefully) across the handle of a wooden spoon, gather up the strings with your hands (they cool quickly) to form a ball. Spoon some glaze on top of the cake, spreading to the edge of the cake allowing it to drip over the sides. Using an offset spatula spread the glaze around the sides of the cake to cover completely. The edges of the crepes will defy any effort to smooth the sides of the cake but that is as it should be. Refrigerate until the glaze is firm and set. Garnish with candied hazelnuts or spun sugar. When serving, remove the cake from the fridge and cut, while still cold, with a sharp knife warmed under hot running water. This should stop all your filling squeezing out when you slice into it. Then leave the slices to come to room temperature for about 15-20 minutes so you get the full benefit of the flavour. I think this would serve 10 generously and would stretch to 12. This cakes looks incredible, you should flaunt it! I love it that you added a coffee twist. That's awesome! It looks wonderful - even layers, stacked high, and how the hell did you manage to get the glaze to cover it so evenly? Great job! Beautiful! And, as always, it's such fun to read through the posts of the Daring Bakers. I doubt I'll ever try making this myself, but I'd love to taste just one bite. Loved reading about this and the other daring bakers expolits. Your cake looked like one of the best. While falling asleep last night I was inspired by the cake to try (at some stage in t he future) a sushi style of this. Coat crepe in filling and roll up, slice. Then with each small slice, coat in choc ganache. Small bitesize options for lots of crepes.